It is a sad fact that the majority of Welsh holy wells are probably lost forever now. Either built over, filled in, diverted for water sources; for some the location is known, but for many even this information is lost. Perhaps Llangystennin falls into this category, although of course new evidence is always being found that could change everything. 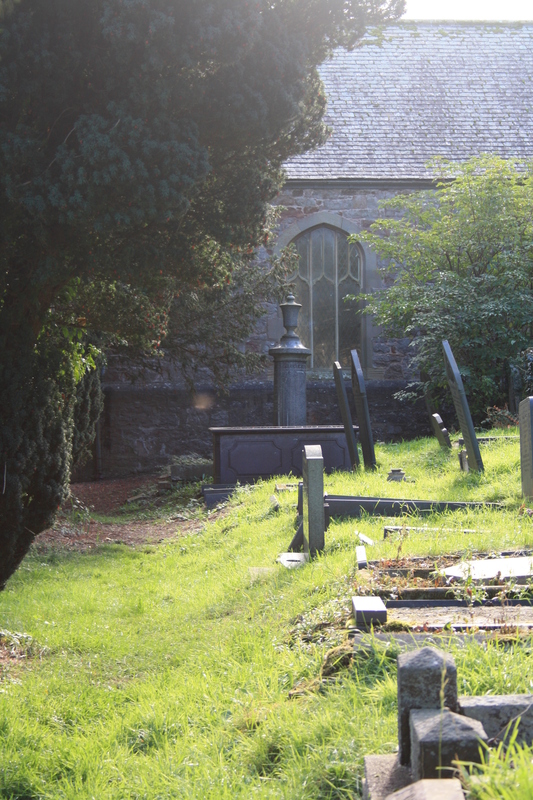 The churchyard at Llangystenin is currently being cleared and rescued from a completely overgrown state by a team of church members, and monuments and history are being resurected from years of neglect. Llangystennin certainly had a well, a well attached to the church is listed in Jones’ “Holy Wells of Wales”, but this is limited to a bare statement of existence with no further details of location or associated customs. Jones does imply that the well may not have been close to the church but nearer to Llandudno Junction, and there are suggestions that it was in the Mochdre area. The current incarnation of the church at Llangystennin was built in 1843, occupying the site of an earlier medieval church, which itself is said to be built on the site of the oldest church in Wales. It is claimed that the first church on the site was established areound the year 330. Some of the fittings of the ealier church were retained in building the current church, although some excellent medieval stained glass was removed, as was a bell believed to date to the ninth or tenth centuries, and one of very few remaining celtic bells in Wales. The bell is currently on display in the Llandudno Museum. The glass too is in the museum, although not presently on display. Some portions of it can be seen here. The existing church does have two attractive Victorian stained glass windows. The church is dedicated to St Cystennin, although there remains some doubt and controversey over the identity of the saint. Cystennin is a celticised form of the name Constantine, and there are a few contenders. For many years it was assumed that this was Constantine, son of the grand emperor of Rome. Baring Gould, in his Lives of the British saints after a discussion of seven Constantines, concludes that it is probably Constantine Gorneu, who flourished in the fourth century and was the great great grandfather of Saints Cybi and Gildas. 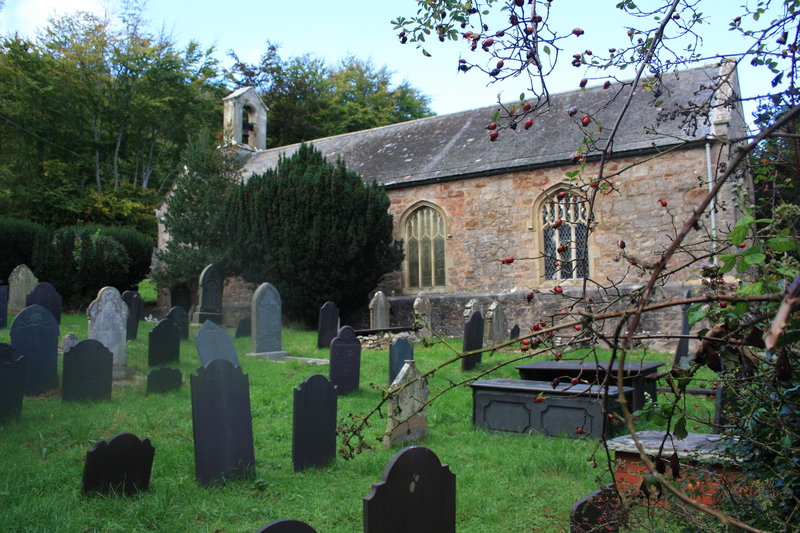 The ephitet “Gorneu” means Cornish, and Baring Gould points to another local church at Llangernyw – “The Church of the Cornishman” , which legend has it was founded by Constantine’s son Digain, as supporting evidence. Despite the relative young age of the church, there are a number of monuments in the churchyard that date from the earlier period. 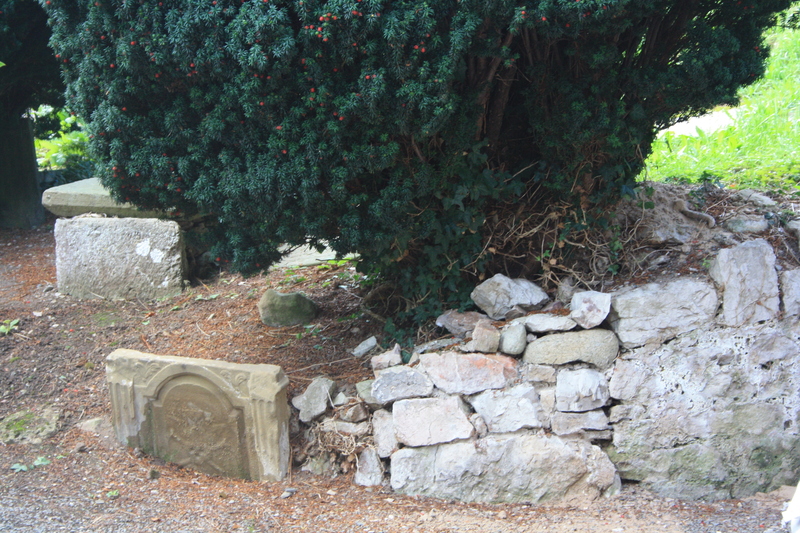 A number of grave stones around the churhcyard bear dates from the eighteenth century, and the “pirate’s grave” beside the main door is earlier still. “Pirate’s graves”, so called because they bear the characteristic skull and crossed bones motif, occur all over Britain. In most cases they don’t contain the remains of pirates, the skull and bones were frequently used to represent a “memento mori”, a reminder of man’s mortality. Above the skull on this stone there is a further emblem which is difficult to decipher. It could be an hour glass, which too is often used to indicate mortality, or it could be the coat of arms of the occupant. Pirates graves, whether they contain the remains of pirates or not, often attract much local superstition. They are often held to be haunted, and there are frequently customs that one should adopt when passing them, or approaching them, to ward off the evil associated with them. According to legend, North Wales produced more pirates per mile of coastline than any other country in Europe, so why shouldn’t there be a pirate buried here? Llangystennin is a little off the regular tourist track, just to the west of Colwyn Bay, it is signposted from the centre of Mochdre; but whether or not the well is unearthed during the restoration of its grounds, it is certainly worth visiting. I have written more about pirate graves here. It would be good to find the well again at some point as so many are now forgotten. Indeed it would, sadly they don’t rank that high on the priorities for conservation, but are always interesting to find. The team working on the churchyard had high hopes of finding it at one time, but there seems to be no sign of it There is some debate over where it actually was – whether it was close to the church or further in the direction of Llamdudno Junction. Thanks WellHopper. Do you, by chance, no anything about St Helen’s (Elen’s) holy well at Coed Helen in Caernarfon. I have being trying to find its exact location for a few years. I wondered whether it was in the vacinity of South Road in the town. It was named for Elen Luyddoc (Elen of the Hosts) who was a 4C Welsh princess that Married Macsen Wledig a Roman governor and, perhaps a minor Roman emperor in Britain. I can’t say that I do, I don’t get that far west too often. Just spent an hour investigating – which obviously doesn’t come near to your work on it, and the only St Helen’s Well I can identify over there is the one listed in Jones at Llanbeblig. Cathrall gives evidence for this in his History of North Wales (1828) says that “there is a well near Hen Waliau still known by the name Ffynnon St Helen, and Mr R says there was once a chapel there.” Hen Waliau is/was a Roman walled enclosure which lies I think between South Street and Constantine Road.as you suggest. There is actually a St Helens Street on the map there, and another called Bro Helen so these could point to the location of the well and chapel perhaps. I don’t know what remains there today, but I suspect the well could easily have been covered over, either by the road or development in that area by now. I hope to get out there again when the days get a bit longer, you’ve inspired me to have a poke around out there, but I have a feeling that the well may be lost by now. Let me know if you find anything. That’s the one. Thanks. I was wanting to put an article on The Northern Antiquarian and, perhaps later The Megalithic Portal. I had a feeling the well was nearer to Llanbeblig. Llanbeblig is named for St Peblig (Publicus) the son of St Elen or Helen of Caernarfon. Her other son was called St Constantine, but not the more famous Emperor of Rome, which confuses lots of people. Some historians have tended to think add to the confusion by saying the Welsh St Helen is one and the same as St Helena, mother of Emperor Constantine of Rome – she is not. I would credit you, obviously, if I put something on TNA. Best wishes, Ray.